In the summer of 1994, while we were getting tired of being assaulted by the crowd in Virginia Beach, my friend Burt took us to visit The US Naval base in the Atlantic in Norfolk, Virginia - the largest naval station in the World. After the usual tourist visit and guided tour, on our way to leave the base, we took a wrong turn and came across what looked like a really tall building. As we got closer, we realized that the building was in fact a huge ship. We asked an officer about the boat and were told that it was the USS Dwight D. Eisenhower. It was not open to the public but he was kind enough to show us around (this was before the 911 events). Boy, what an impressive ship it is! 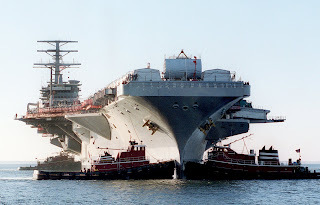 Launched in 1975, it is the second of 10 Nimitz class aircraft carriers. The asphated deck is so long (1092 ft.), that you can jog along it. It is 252 ft. wide. It is propelled by two giant nuclear reactors connected to 4 screws (66,200 lbs. each) up to more than 30 knots (54 km/h). More than 6 200 men can live aboard. Distillation plant capacity: 400,000 gals. Publié par Unknown à l'adresse 7:50 a.m.